The Maroon Bells are located in the Maroon Bells-Snowmass Wilderness, (near Aspen), and are considered to be the most photographed peaks in Colorado. If you’re a nature lover and wondering what you want to see in Colorado, I highly recommend visiting these peaks. I consider them to be the most spectacular mountain peaks in the United States. And don’t take my word for it-come see them for yourself! They are postcard perfect. And that reminds me; although I can show you pictures of them, they really have to be seen in person to be appreciated. Pictures just don’t do them justice. Since the Maroon Bells are located in the White River National Forest, that means they are dog friendly. Just make sure you keep your furry friend on a leash. So, if you’re looking for the directions there, here they are: from Glenwood Springs, take Hwy. 82 south towards Aspen. 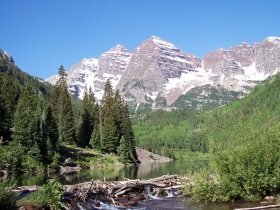 (It takes just over one hour to reach the Maroon Bells from Glenwood Springs, and a little less if you're staying in Carbondale.) As you approach Aspen, you will see the Aspen airport on your right. Keep following the road and cross the bridge over Maroon Creek. Just beyond Maroon Creek, you’ll reach a roundabout. Enter it carefully and follow the sign for Maroon Creek road. If you see the church tower, you’ll know you’re going the right direction. From here, just keep following the road until you reach the pay station. After paying the fee, just follow the road until it ends at the parking lot. Before you get ready to hike, you might be wondering what kinds of wildlife you might see here. We have seen deer on rare occasions, (including a baby with spots), and if you're really lucky, you might see moose, as you see in this picture. 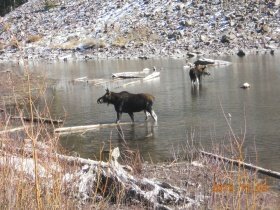 We weren't so lucky...this picture was taken by Dave Wilkins, and he was lucky enough to see these moose in Maroon Lake. I'm guessing that the moose usually only show up when there are fewer people around...like early in the season, or late in the season, as was the case here. Anyway, if you're planning a trip to Colorado and want to see the Maroon Bells while you're here, I suggest staying in the towns of Carbondale or Basalt. Or if you'd like to stay in a larger town, then I suggest Glenwood Springs, which has more restaurants and shopping. Aspen and Snowmass Village are the closest towns, and cost more, but do give you the advantage of a shorter drive to the "Bells", and therefore a better chance at a parking spot when you get there. Like this photo? If you do, you can have it on a mug or other item. Just click anywhere on the photo to see what's available. Makes a great souvenir or gift :-). And watch for sales, which happen often. In 2018, it costs $10.00 to see the Maroon Bells. And the road that goes there is currently closed since they close the road during the winter. But I will let you know as soon as I find out about the road being open. It tends to be a little different each year, depending on snow levels. In 2011, our mountains received a lot of snow, especially in the spring. 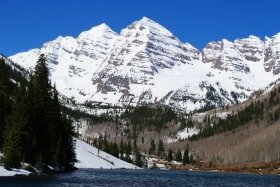 So when we visited the Maroon Bells on May 31, 2011, the picture on your right is what we saw. It was beautiful to see them this way in person :-). Also, if you're driving, make sure you arrive at the pay station before 7:00 a.m., (not a typo), so you have a chance at getting a parking spot in the parking lot. We arrived at the pay station at 7:00 a.m., and when we arrived at the parking lot, we were told by one of the parking attendants that we were one of the last cars allowed in. And that was on a week day. So you might want to be there even earlier on weekends. O.K., about that round-trip hiking time, you will probably complete the hike faster than we did. I took many, many pictures on this day, so we spent more time on the trail than we otherwise would have. The other thing you might want to know is that this trail does not make a complete loop around the lake. So at one point, you’ll be retracing your steps. Before I go any further, I should tell you that there is both a lower, and an upper scenic loop. We did both. So, starting from the west end of the parking lot, follow the easy path along Maroon Lake. 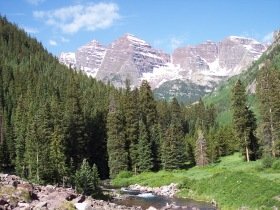 In front of you is the breathtaking panorama of the Maroon Bells. Both of the “Bells” are fourteeners, meaning they are both over 14,000 feet high. At one point, you’ll come to a bridge. It’s your choice here which direction you want to follow the loop. You can either cross the bridge, or you can follow the narrow trail on the right, just a short distance before the bridge. We followed the narrow trail on the right. Maroon Creek keeps you company along the way as the trail leads you into an aspen forest. Eventually, you’ll come to another bridge. If you’re short on time, you can cross the bridge and hike the trail back down to the parking lot. Otherwise, follow the trail around and up beyond the bridge. You’ll continue on through the aspen forest, and at times, will lose sight of the Maroon Bells. Keep working your way up and at some point, you’ll notice that you’re now walking back down the mountain. Along the way, you’ll find columbine flowers sprinkled around in various places. Soon, you’ll come upon a beautiful rushing cascade. 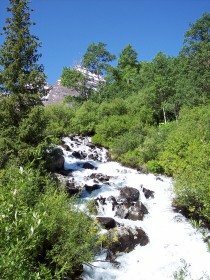 At the top of this cascade, you can see a small portion of the Maroon Bells behind the trees. I guess it’s too much to ask for, to have a complete, unadulterated view of the Maroon Bells in that spot! From this point on, just keep following the trail down until you reach the bridge. This time, you want to cross it. (Although if you want to, you can follow the trail that passes to the left of it, which also gets you back down.) If you cross the bridge, you can then take some pictures of Maroon Creek with the Maroon Bells in the background, that will be slightly better than the mostly hidden view of the “Bells” at the top of the cascade. Trail starts from west side of the Maroon Lake parking area, before you reach Maroon Lake. You’ll see the bridge to the left of the parking area. Cross it and turn left to follow the trail down-valley along Maroon Creek. The easiest way to hike this trail is to start from the top end and follow it down to the East Maroon Portal. That way, you can catch the bus back up to your car. If you choose this option, make sure you bring your Maroon Bells car pass with you. Show it to the bus driver, and you can then ride the bus for free. The forest service doesn’t check cars for passes at the parking area, so you don’t have to worry about that. So, down the trail we go! The first thing you might notice about this trail is that parts of it seem to be inhabited by flying bugs. So, this would be the place to use your bug spray if you have it. We didn’t have ours but managed to escape the bugs anyway. Once the bugs are taken care of, this is a really nice trail. In fact, I think that if this trail was located someplace else, it would be more popular than what it seems to be. (We only encountered one other person on the trail.) For one thing, a good portion of it follows along Maroon Creek, which is always a plus. For another, the trail is mostly in the forest, which is good for hot days. That includes both pine forests and aspen forests. The aspen forests were lush and green. And in between the forests were open meadows which, during wildflower season, would be strewn with wildflowers. We were a little early for that, so missed out. (The best time is usually from about early to mid July.) But we did see columbine flowers, (our Colorado state flower), in various spots along the trail, and they were definitely in bloom! So anyway, the trail starts out by following along Maroon Creek in a pine forest. Not long after this, you come out of the forest and cross a couple of rock fields. The trail through the rocks is clearly defined; just watch your footing. From these rock fields, turn around and take a look at the Maroon Bells. They are magnificent from here! At one point, we were lucky enough to see a baby deer, (spots and all), in one of the aspen forests. But we didn’t see any sign of its mother and hoped that she was hiding somewhere nearby. We were only able to watch the deer for a few seconds before it decided that the best thing to do was to steer clear of us. So, keep an eye out. You never know what you might see on a hiking trail. The rest of this trail is pretty much the way I’ve already described it. Eventually, you’ll reach the bottom of the trail and a small parking area. From here, you want to follow the only road back up to Maroon Creek road. It’s only a short distance there, and you’ll see the sign saying “East Maroon Wilderness Portal”. Once there, cross the road and wait for the next bus up to Maroon Lake. Unless you just missed one, you shouldn’t have to wait that long for the next one. Depending on the time of day, they run every 20 minutes, or every half hour. Also, when you see the bus, make sure you flag down the driver. They don’t stop unless you let them know you need a ride! From the parking area, follow the trail to and around Maroon Lake. If the day is clear, and the wind is calm, you should be able to see a reflection of the Maroon Bells in Maroon Lake. Mornings are usually the best time for this. Anyway, be watching for a sign on your right that says: Crater Lake. Follow that trail and before long, you’ll be in a thick aspen forest. And that reminds me: this trail makes an excellent fall color hike. So, bring your camera…actually, bring your camera any time that you’ll be here because it really is a beautiful area. The trail itself tends to be rocky and dry so make sure you wear good hiking boots and bring plenty of water. At one point, you’ll come to a spot where, (if you turn around), you can look down and see Maroon Lake below you. It looks like something you might see in a postcard. 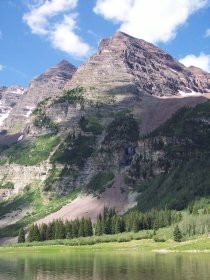 So, keep hiking your way up and closer to the Maroon Bells. At about the ¾ mark, you’ll be able to see Crater Lake off to your left. From there, it’s just a short hike to the lake and if you brought some sandwiches, you can find a comfortable spot to sit, have lunch, and take in the wonderful scenery all around you. The Maroon Bells is my favorite spot in Colorado. And I think it’s one of the best places to see fall colors in Colorado. If you’re going, mid to later September is usually about right but don’t hold me to it since each year is a little different! The last time we visited the Maroon Bells for fall colors, many of the trees had changed, but others were still green. Even so, it made for a nice contrast, so we still had a good day there. Then we drove Independence Pass on our way home, where we saw plenty more fall color. All in all, it was a great day :-). Return from Maroon Bells to Colorado Hiking Vacations home page. 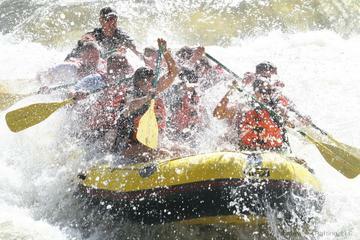 After you spend a part of your day at the Maroon Bells, I thought you might enjoy a half day rafting trip on the Colorado River. From time to time, I get requests for information about rafting, and the Glenwood Springs area is definitely a great place to do this. I always see people rafting on the Colorado River when I'm over in that area, and it's a good way to cool off on a hot day :-). So if you think you might be interested, just click on the below picture of the people in the raft. It will take you to the page where you can get more info. about this tour, and if you like what you see, you can book it. It's an affiliate link from Viator, (a TripAdvisor company), and I will receive a small commission for every tour that you book through this link. Thank you so much :-). If you'd like to do another great hike while you're in the Aspen/Glenwood Springs area, you could do the hike to Hanging Lake. It's a beautiful turquoise colored lake with a set of falls that drops into it, and the best time to see it is during the spring run-off, usually in May. It's a 1.2 mile one-way hike that's fairly steep, but the pay-off at the end is definitely worth it.